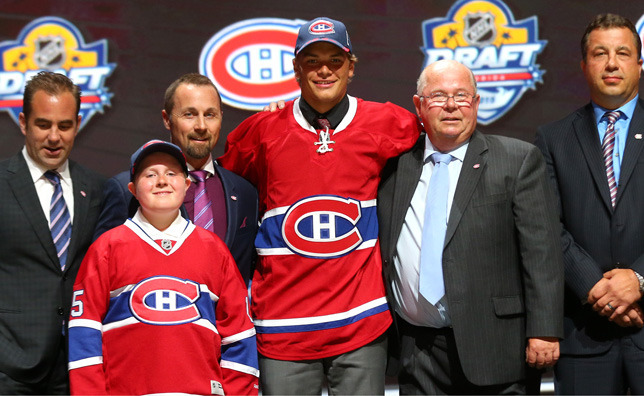 SUNRISE – The Habs bolstered the blue-line with their first pick in the 2015 NHL Draft. Heading into the draft, Marc Bergevin left the door open to the idea of trading his first round pick on Friday night to try to add a few more to the board in subsequent rounds. But when he saw Noah Juulsen still sitting in the stands when the 26th overall selection rolled around, he had every intention of fitting him for a Habs jersey. After 2014 first rounder Nikita Scherbak was traded to Everett this season, the Habs’ brass had plenty of opportunities to scout the Silvertips in 2014-15 – a season that saw Juulsen increase his offensive production by over 400 percent. Having a few extra sets of eyes watching as the 6-foot-2 defenseman piled up 52 points in 68 WHL games helped make the Canadiens’ decision on Friday night an easy one. “Martin Lapointe and Rob Ramage, who are in charge of developing our young players, saw him play in Everett when they went to watch Scherbak. That wasn’t their primary job, but they had good things to say about him,” shared Bergevin. “He’s a good skater with character and he competes. That’s the kind of player who will always find a way to have success. He’s a Kevin Bieksa or Jeff Petry type of guy. After we picked him, a few people came over to tell me they thought he was a great choice. Juulsen will be happy to hear the comparison to Bieksa made by his new general manager. The Abbotsford, BC native has spent the last few years emulating the Vancouver rearguard’s playing style, augmenting his offensive output while still taking care of business in his own zone. NHL Central Scouting’s 22nd-ranked North American skater heading into the draft, Juulsen confessed that by pick No. 26, he had already begun wondering if he would need to make a return trip to the BB&T Center on Saturday to finally hear his name called by an NHL team. With no picks available in the second round, the Habs had no interest in letting the big blue-liner slip through their fingers.